i couldn’t agree more, it is actually about prefabricated reuse of materials and the spatial synthesis of the way we live. if you have a few minutes i would head over to bldgblog and read the full post including the wonderful projects by lab zero highlighted throughout (partially pictured above). as i discovered at treehugger, and aptly named the zero house, this gorgeous prefab generates all its own energy requirements and produces no waste. 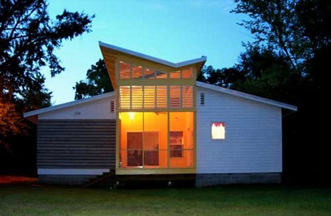 designed by scott specht, the zero house is a modest 650 sqft. dwelling. the cantilevering roof features photovoltaic cells that easily generate all the structure’s power requirements while also acting as an active rainwater collector (a 2,700 gal. cistern stores the water for later use). furthermore, the house contains a composting unit that processes biological waste “in-house.” the rest of the house features energy saving design strategies including ample daylighting (led lights are used for artificial light requirements), incredibly energy efficient wall assemblies (r-58 in fact), triple glazed windows, and a compact design (reducing overall energy requirements). while the zero house may be the model of energy efficiency and the envy of the sustainable design community it is also a wonderfully sleek and aesthetically pleasing design. as you can see from the interior rendering below, both the finishes and the spatial arrangement are clean and refined. i find the compact, multi-level design to be invigorating, but the real celebration here is in lack of environmental impact. building’s generate a largely disproportionate amount of pollution and readdressing the way we build is fundamental in rehabilitating our planet and curbing our wasteful lifestyles. the design of the zero house can be viewed as a harbinger of what could come, what should come. the more proposals for sustainable housing are released and/or built, the more aware the public becomes of the problem and the more acclimated and accepting to the solution we become. 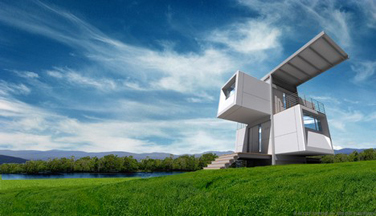 i first read about the habode prefab at cubeme the other day. 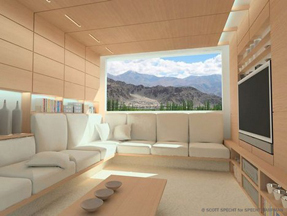 designed by new zealand architect rod gibson, this 39’x22′ (850 sqft.) 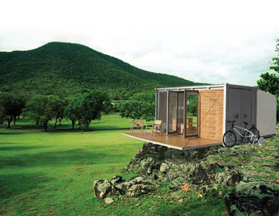 dwelling is an environmentally friendly prefab. As we’ve discussed before, prefabs are inherently a more sustainable building process as a result of less waste and more quality control, but this prefab furthers the notion of responsible design by incorporating energy saving techniques into the architecture of the dwelling. some of these design moves include ample sun shading, natural ventilation, and plenty of daylighting. the one design aspect that intrigues me the most, however, is the beautiful butterfly roof. 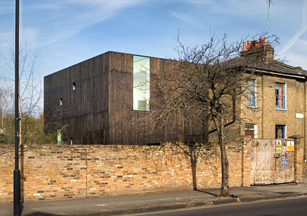 it appears as though its a simply aesthetic choice on the part of the architect. i really wish this naturally inward curving roof had been used to harvest rainwater that could be incorporated into a greywater system throughout the house. considering all the other subtle design moves that were made in order to achieve such an energy efficient dwelling it seems remiss to me that this easy passive design move would be overlooked. nonetheless, i am a huge fan of this structure. i find it both entirely playful and extremely inviting. in fact, i may have to investigate the habode further as a thesis case study as a function of it’s flexible nature. yesterday i found another incredibly beautiful prefab. 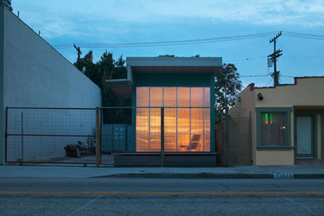 the showhouse, designed by jennifer siegal and the office of mobile design, is located in venice, california. coincidentally, jennifer was part of a panel discussion on creating a sustainable future at the last day of the symposium c6 conference here in chicago, the panel also included bruce mau, natalie jeremijenko, and lucy orta. 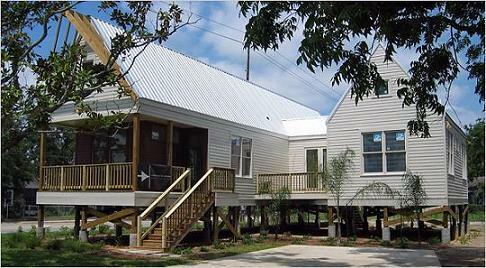 regardless, the showhouse is a brilliant example of prefab done right. nothing in ms. siegal’s design gives the structure that kit-of-parts/off-the-shelf feeling that many other prefabs suffer from. the best part, however, is the use of sustainable materials and and systems throughout the house. 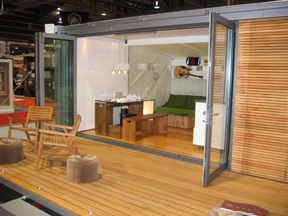 included are radiant heated ceiling panels, tankless water heaters, and translucent polycarbonate wall sheets. 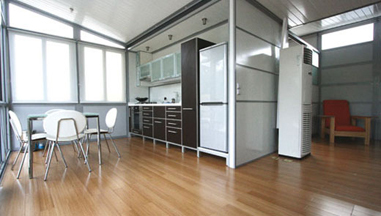 additionally, the house makes use of bamboo, coconut palm, and kirei board flooring. the office of mobile design has prefabs starting at around $240/square foot, which means their prefabs won’t break the bank either. for me though, the warm palette of colors and materials that is used so seemlessly throughout the house as a result of some wonderful detailing really makes this house come alive. i’m always a fan of luminous translucent materials like the polycarbonate wall panels employeed on one facade. 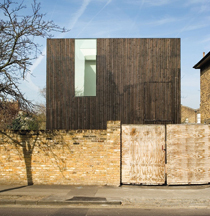 simply put this is a subtlety gorgeous prefab. 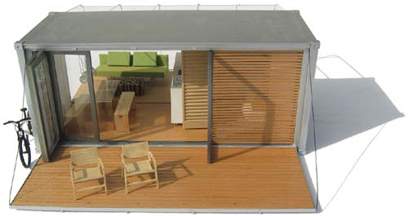 once the unit has arrived on site, the walls simply fold down and effectively triple the prefab’s livable area. no water, waste piping, external power, or other hook-ups are necessary. 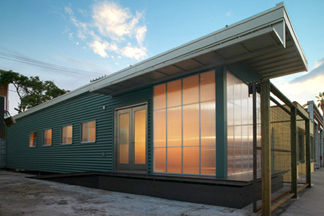 built to house a family of four, the atc is an ingenious, sustainable, and efficient prefab. did i mention it looks great too? currently the atc is in vancouver on tour throughout canada. check out bark’s website for more photos including additional interior shots. 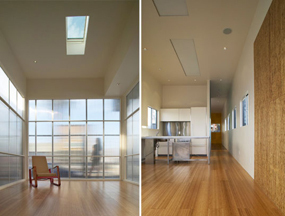 i ventured over to marmol radziner’s website today as i haven’t been there in a while. i found beautiful new custom prefab located in utah, aptly named utah house 1. designed with 15 of marmol radziner’s typical modules, the house is 2,500 square feet in area with over 1,700 square feet of outdoor deck space and has two bedrooms and two bathrooms among other living spaces. 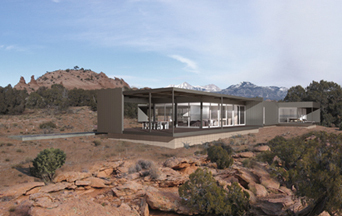 perched on a rocky hill with a commanding view, the floor plan of utah house 1 branches out and begins to claim outdoor areas as part of the house, similar to many of marmol radziner’s custom prefabs. 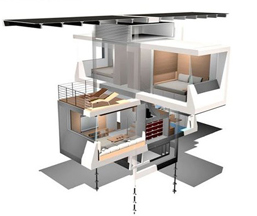 sustainable features include pv cells on the roof, insulating glass, naturally lit spaces, natural ventilation, responsible woods, and energy efficient appliances. of course, the prefabricated nature of the architecture lends itself to reducing construction waste and debris while increasing quality control. 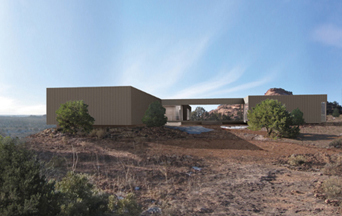 the subtle, natural, colors employed throughout the design begin to engage the site in a delicate, organic, dialogue. the magic, for me, happens in the winter though, as the structure stands like a warm toned rocky outcropping amid the fresh snow (see below). additionally, the low slung nature of the design only serves to emphasize the buildings natural surroundings and make the views to and from the house that much more dramatic. venture over to marmol radziner’s project page to see more great photos and wonderful images of in-factory assembly and on-site installation. 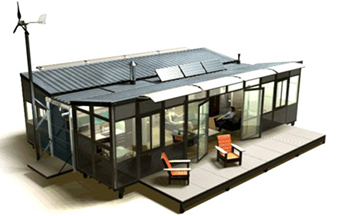 mocoloco had a wonderful link this morning to a modular home designed for habitat humanity by students and faculty at auburn university in alabama. 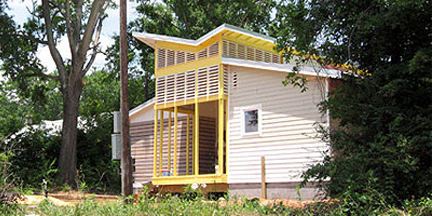 the home has won an aia housing award for 2007. the designhabitat2 house, as it’s called, was both designed and built by auburn students under the tutelage of professor david w. hinson, aia. 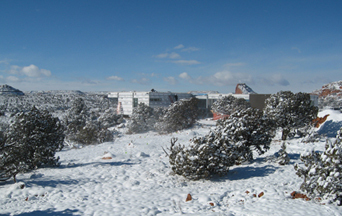 two factory-built modules at opposing sides of the structure were connected on-site by a central, site-built, portion. as a habitat for humanity home is, this dwelling is modest; unlike most habitat homes, that tend to be standard cookie-cutter suburban tract homes, this one has a wonderfully articulated design. i love the delicate nature of the butterfly roof at the central core. it would be phenomenal if this was part of a rain water catchment system to provide use of greywater on site; unfortunately, i have no idea as to whether this is happening or not. naturally though, the modular prefab nature of the dwelling makes it more environmentally friendly than typical on-site construction. no word on other sustainable aspects of the home, if any, but i would suspect that the rest of the house is fairly sensitive to sustainable issues as most modular homes tend to be. there are some wonderful construction photos available at the designhabitat2 website. 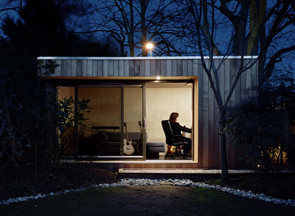 meet the ecospace studio. 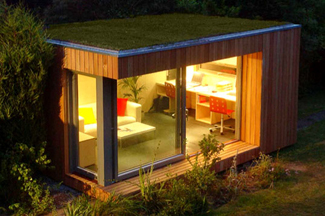 this small prefab is intended to be a sustainable studio space detached from your home. starting at about $35,000 for the base model, which i assume is the 3.6m x 3m version, the studio is completely environmentally friendly. sustainably harvested timbers and other environmentally friendly and recycled materials as well as a ready-made living roof create this tiny wonder. rest assured the walls are fully insulated and their is a capacity to heat the space as well. the unit itself rests on adjustable bearing shoes so no intrusive foundations are needed; consequently, the site remains undisturbed. 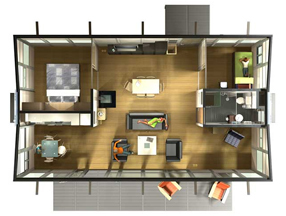 while the base model is no more than a one room studio there are several significant options/module upgrades which include a kitchen, a bathroom, a bedroom, or a mezzanine. i love the idea of this simple respite space out in the back yard, somewhere to retreat and get some work done or just go and take a nice long nap. the small space is seemingly perfectly scaled, small but certainly not too small. the warmth of the materials used in construction really help to make this space so wonderful. so far it seems they are only sold in the u.k. here’s hoping they come to the u.s.